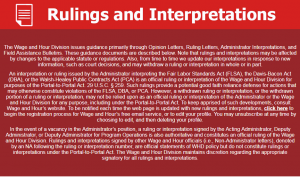 The Wage and Hour Division (WHD) of the Department of Labor (DOL) announced today that it has issued three new opinion letters. An opinion letter is an official document authored by WHD on how a particular law applies in specific circumstances presented by the person or entity requesting the letter. Opinion letters represent official statements of agency policy. In June 2017, Secretary Acosta announced that the department was resuming its longstanding practice of issuing opinion letters. The department had issued opinion letters for more than 70 years before ceasing the practice in 2010. In January, the WHD reissued 17 opinion letters that the Obama DOL had withdrawn. The public is encouraged to submit requests for opinion letters to WHD and can visit this webpage to learn how to request an opinion letter or determine whether existing agency guidance already addresses their questions. WHD will exercise discretion in determining whether and how it will respond to each request.